I am an unabashed Viognier freak. Have been since I tasted my first glass of the hallmark white of that pastoral little elbow of the Rhone Valley, back in 1981. I’ve frequently been asked, by customers and readers, to describe Viognier, which many people approach as they would a scorpion, as though something weird might befall them. The best descriptions I’ve been able to muster have been, “Like Chardonnay, only moreso” and, when being glib, “Chardonnay on Steroids“. Neither is particularly accurate but, in trying to ease people past the yips of trying a grape they’ve never heard of, I oversimplified on purpose because, once they do take the plunge and actually taste Viognier, many of them eagerly start running down that road that I’m on and never look back. It’s a wonderfully stony and desert-dry wine; the virtual antidote to grapes that convey gobs of fruit impression or even actual residual sugar. One Washington winery famously sneaked some sugar into their estate Viognier, until their peers shamed them out of it or maybe it was because they changed winemakers. Probably some combination of the two, but the gist of it is that Viognier is traditionally a grape that is sufficient unto itself and monkeying around with is considered unwise…and, of course, California has, for 100 years, been the Western world’s epicenter of Monkey Shines. California vintners used to routinely stick this handsome, expressive stuff in oak barrels and give it the same vanilla cream ‘n’ woodsmoke treatment that almost all CA whites received, on the theory that people like oaky wines better than clean ones. For better than fifty years, in fact, that was the case and, hey, a winemaker’s gotta eat, right? BUT, as Americans have become more wine-savvy, the taste pendulum has swung back to using less oak and more clarity and letting the grapes have a say…and this has been all to the good, both for the wines and for business. 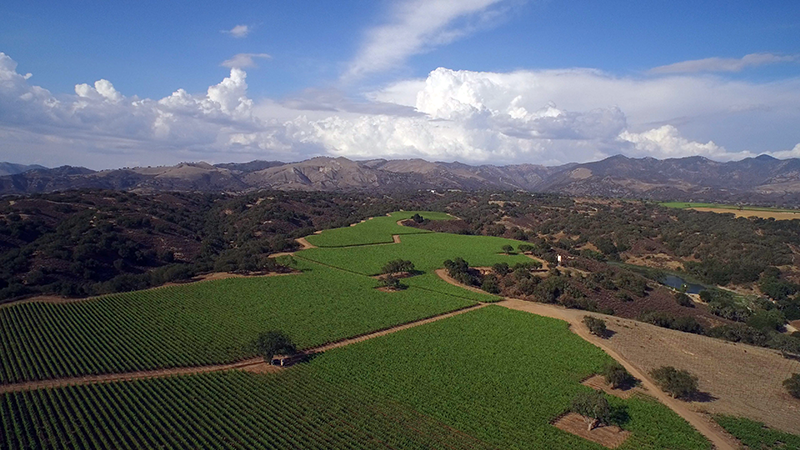 More than most Cali wineries, Zaca Mesa, located in Santa Barbara County, has kept their eye on the stylistic ball in making all their wines. They’ve arguably embraced the same “house style” since their inception in 1973; a style which includes big flavors that seek Balance: acids present but never aggressive. Tannins supple and firm but not overly chewy. Moderate alcohol, and judicious use of barrels. Oh, they’ll use a barrel and they do it well and, when the wine calls for it, a Zaca Mesa wine, especially their near-legendary “Black Bear” Syrah, can show copious oak silkiness and vanilla but always balanced. In this glorious bottle of 2014 vintage Viognier, Zaca Mesa gets it Right. This is a big, silken, crazily expressive Viognier that has gotten a kiss of oak; just enough to lift and elevate the beautifully juicy flavor profile and give those ripe pears a slightly baked quality that I find immensely flattering. It shows lovely, food-buddy acidity and is absolutely made for pairing with something like a grilled chicken or roasted turkey or an elaborate seafood salad or even a pork tenderloin roasted in a stoneground mustard glaze. The texture is stunning: a touch viscous, like any great Viognier, but light on the palate, clean, crisp, and gorgeously distinct in its flavors. They almost show up in a line, with name tags: those yummy pears(! ), fresh-sliced peaches, grilled apricots, honeysuckle, nectarines, and jasmine. The minerals are forthright and flattering, with a lovely note of stone overlaying the whole profile. It finishes slowly but utterly clean, leaving a faint impression of spiced peaches that lasts literal minutes after the swallow.